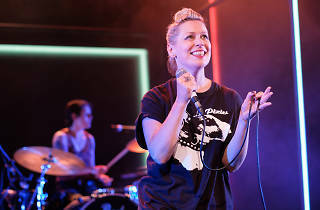 Ever since she she came to prominence as an all-round Scots theatre polymath, it’s been a well-established part of Cora Bissett’s CV that she was in Kirkcaldy indie band Darlingheart, who came within spitting distance of fame in the early ’90s before falling apart messily. It’s not a story she’s ever told in a show before, though, but now recent events mean Bissett has evidently achieved enough closure on the period to go for it. 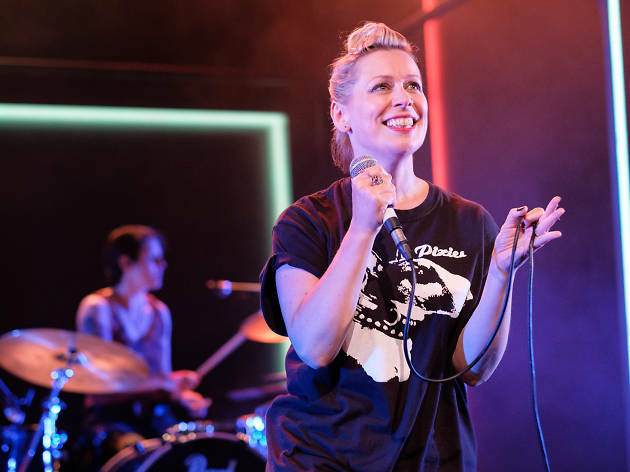 Loosely speaking ‘What Girls are Made of’ is an autobiographical gig theatre show, with Bissett as lead singer and the three other actors playing her band mates and the sundry chancers they encountered on the way. It touches on everything from Bissett’s love of Patti Smith, to her relationship with her parents, to her adventures in London after the band had folded. But mostly it’s a music memoir, warmly, vividly painted, with Bissett an emotional, open focal point. For me, about a decade younger than Bissett, the story of Darlingheart’s rise and fall is both gripping and somewhat nostalgic – I grew up reading the music press in this era, and lapped up the stories of bands’ boom and bust. There’s a tragic glamour to it, that doesn’t really exist now there’s no money in the biz and no major label would take a punt on a Darlingheart. Energetically directed by Traverse boss Orla O’Loughlin, ‘What Girls Are Made Of’ is a romp through those times, beautifully told, bedaubed with songs – PJ Harvey, The Sultans of Ping FC (! ), even one Darlingheart track, the Throwing Muses-alike ‘Smart Head’ – charged with the rush of the times. Darlingheart meet a dodgy manager, make an album, tour relentlessly, meet a posh young Radiohead, play the gig of their lives supporting Blur at the Astoria… and then a venomous NME album review pretty much ends their career at a stroke. The rest of the show is a hop skip and jump through the rest of Bissett’s life, which initially seemed a bit arbitrary: after being a structured guide to one particular period, it suddenly lurches into fast-forward. But I think Bissett is trying to say how much her indie days shaped her. She made some mistakes, and it ended badly, but it seems like something to be proud of as she – slight spoiler alert – ends the show with a rousing, slightly cheesy and entirely joyous celebration of female resilience, set to the ebullient rattle of Patti Smith’s ‘Horses’.